What I’m finding most interesting about the shift to cloud computing, this transitionary period in which we find ourselves, is that it has almost nothing to do with technology. It’s actually all about economics. By moving to the cloud – real cloud, not cloudwashing – we’re utilising economies of scale in IT infrastructure, using the same physical stuff to deliver the same things. But by building shared infrastructure at scale we’re allowing the resources to be consumed much more efficiently. This follows the same path that occurs in all business activities, from that first innovation through to ubiquitous commodity provision. Eventually the physical product becomes a utility service. This is actually rule #1 from Joe Weinman’s 10 Laws of cloudonomics. If the demand has peak to average ratio of at least 2:1 then you’re on to a winner. If the demand is spiky, then pay-per-drink pricing makes sense. In fact it’s more economical to use public cloud resources on pay-per-use, even if the unit price is twice as much as equivalent fixed, physical resources. This is because you don’t pay for the resource when you’re not using it, unlike when you build and run your own datacentre. It’s this economic advantage of utility pricing that is invaluable for startups and SMEs, for whom the barriers to entry have been lowered to the floor; anyone with a laptop and a credit card can rent servers by the hour. Also, they don’t have to pay for the resource until the point they’re actually (hopefully) making a return on it. These on-demand economics can also be attractive to large businesses, depending on requirements. Brilliant. Everyone will save lots of money then? Er, well no. Not exactly. What we have is proof that cloud computing is more efficient. The Jevons Paradox has been brought to the foreground of discussion by several of the cloudarati recently, most notably Simon Wardley. I have to hand it to Simon, the presentations from OScon and other events last year are great – a fine example of how to present visually, with humour and personality. 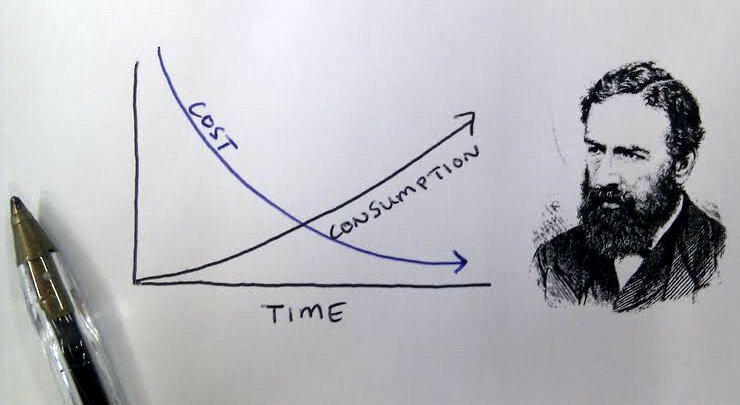 What old Jevons worked out in 1865, when he was just 29, was that when things become more efficiently consumed (therefore cheaper) this tends to increase consumption rather than decrease it. When we look at history we find this pattern occurring repeatedly, especially during the industrial revolution when things really kicked off. We take advantage of any savings. We demand more. When coal fired steam engines become more efficient we burnt more coal. When car engines become more efficient we just drive further; we live in commuter towns and go on holiday. Stop and think about it for a moment. When have advances in IT efficiency ever caused budgets to shrink? What happened when CPUs and memory became faster and cheaper? We bought bigger, better computers to run more intensive apps. When we can do more with less, we just end up doing much more. To see how the theory translates in practice, have a look at Andrew Mcaffe’s graphs which illustrate the Jevons effect on the history of IT spending. The only time total expenditure dropped was just after the dotcom crash. We can assume that general IT demand is going to increase with cloud, but the composition of IT budgets will also change as the transition continues and costs are shifted from fixed to utility services. It seems, from looking at economic history, that the main benefit of cloud is not overall cost savings. This is essentially about doing more stuff. It’s about reduced barriers to entry and lower risks. It’s about increased agility of business and an increased ability to innovate. Update: What impact do private clouds have on all this? And aside from the maths, how do people actually feel about the different pricing models? There are of course two delivery models for cloud services: public and private. I won’t get into security, governance or semantics here, whether private cloud is an oxymoron, or any of that stuff. That’s a separate discussion – for now I’m only interested in the cost models. So when it comes to economics, how can we compare public and private? Understanding the value of each is crucial to understanding the use cases. We know that public cloud has on-demand characteristics that are invaluable to SMEs starting out with zero infrastructure, but what about the large corporates? Stephen O’Grady explained his take on this. I imagine this is analogous to the same reasoning behind an individual selecting a PAYG phone, or a contract phone. The on-demand, accessible economics are evident in the public cloud. You have as much as you want on tap, but the elasticity of price might also introduce uncertainty. It’s accessible, but pure pay-per-use may not be considered sustainable by large entities. When private clouds are built, this changes the operational cost model to suit those who like a more long-term, predictable outlook. I’ll be very interested to see how the cloudonomics discussion shapes up as adoption of both public and private services increases. This entry was posted on	February 14, 2011 at 6:27 pm	and is filed under cloud.